After working in three different child care centers across the country and as my first child grew, I understood more concretely how my decision to leave my child in the care of others would impact him. 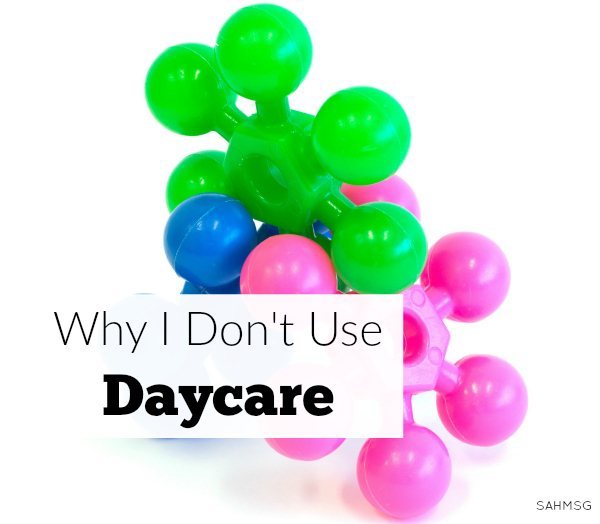 It is the personal choice of my husband and I to not use day care. This choice does not mean that we think that parents who send their children to day care in homes or centers are bad parents. 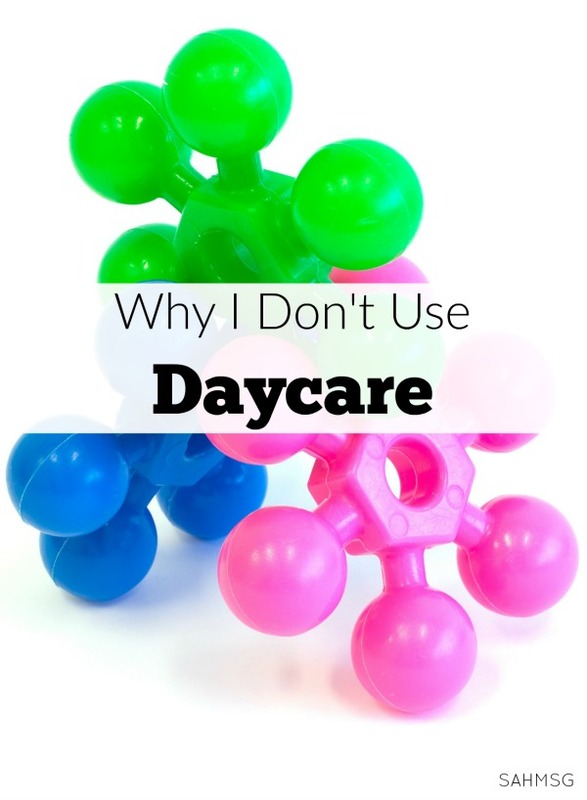 We just choose differently, and if you do too, you may relate to these reasons why I don’t use daycare. ‘Daycare kids’ can thrive and be successful. We just don’t want to risk missing anything or give parenting power to anyone other than ourselves. My opposition to the use of daycare does not mean I want parents who utilize it to fail at parenting. I certainly want all children to grow up to feel loved, supported (if they are choosing positive avenues to explore in life) and be successful. I want all parents to cherish their roles as parents and the time they have with their children. I want all parents to have a strong and positive relationship with their child throughout their lives. 1) I do not know the caregivers personally. If I was still living near the daycare centers at which I worked, I would know caregivers in each room and would feel good about leaving my child in the care of an adult that I trusted here and there when I needed a babysitter. The fact of the matter is, we are teaching children to trust strangers when we leave them in the care of an adult that we don’t know. I understand after day 1 in a new child care center the caregiver becomes ‘known,’ but it is different than an established, trusted relationship. Yes, I know that when my child enters school his teacher will not be well known by me. We can’t compare the understanding of an infant or toddler to a child who is 5 or 6 years old. 2) I would be teaching my child that trusting a stranger is acceptable and necessary. Adults in childcare centers have passed background checks, sure, but I have worked with these caregivers and I would not want some of them caring for my child. I was able to observe co-workers on numerous occasions over a year or more of time. Most parents don’t sit in the child care room even for a few hours when they drop off a child…a 6 week old child who is defenseless and helpless. 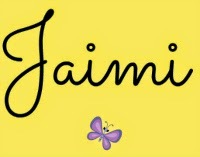 A precedent is established that whatever adult you as the parent choose to leave your child with, is trusted and safe. (Yikes!) And we wonder why so many children ‘go along’ with inappropriate situations with adults. 3) The ‘daily grind’ is too much stress for a little one. Adults always complain about ‘the daily grind’-wake up, get dressed, drive to work, drive home, make dinner, fit in family time, and go to bed, just to do it all over again the next day. I don’t want my children having to experience this adult grind as young children. 4) I don’t want my child to be in a situation where he is defenseless. I am actually planning to send my son to preschool. He is enrolled because he is potty trained and can verbalize to me if something happens at school that we need to discuss further. He has an understanding of his personal space and that it is only for him. We have taught him that his private parts are not for anyone else to see or touch. In the child care centers where I worked, there were not doors in the bathroom to allow each child privacy. Children are too exposed in child care for my liking. Infants need sleep when they are tired, not alarm clocks. Toddlers need secure, consistent caregiving as they begin to figure out how they can get their hands on the world around them. Preschoolers need to understand that their body is their business and be independent in self-help with this area. My brother was a clerk for a State Supreme Court Justice out in Oregon. I mentioned to him that I felt like such an odd ball since I was the only mom I knew (in my circle of close friends) who had never placed my children in child care. He told me that my apprehension was warranted. Of all the child abuse cases that come across his desk, most involve a person who had easy contact with a child. I don’t wish failure on the parents or children who utilize child care outside of the home. Maybe they know their caregivers, can balance the stress of working outside of the home better than the rest of us and still keep their family formed as one cohesive unit. I just want to empower moms to realize how precious are the first 5 years of our children’s lives. We, and they, don’t get them back. What are your thoughts on daycare? I have three children and I have never placed any of them in a daycare. I once did a report in a writing class about the dangers of daycares. But let’s be honest, leaving children with “trusted family members” can be just as dangerous. I couldn’t afford to quit my job, so my husband and I work opposite shifts so one of us can be with them. I have 4 month old and a 2.5 year old. I have been debating whether to quit my new job so that I can stay home with my babies. I thought this job with the great schedule was the answer to my woes, but turns out I was wrong. They are in daycare right now, after reading this I think I've made up my mind. It kills me everyday to leave them there. I am so afraid of not being able to handle being a stay at home mom, my hubby thinks I'm going to let them watch TV all day. I'm glad I found your website, it makes me feel like I can do it. 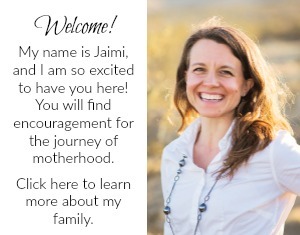 First off, I am thrilled that my site here is encouraging you! If you are able to stop working, it is worth a try for your children and your family. My post above is really meant to be an inside story, and I hope it does encourage moms who are able to choose to stay home to at least try it. I think your children can only benefit. My mom had the tv on a lot when we were kids because she worked part time night shift and needed us occupied so she could sleep at times. My kids watch much less tv than I did as a child and you know what? I still got good grades, like to be social with friends, and don't appear to be too scarred from the experience. 😉 I think being a SAHM is intimidating just because you do have all day to be with your kids and often that means we feel like we have to do something with our children every moment-not true. Being at home is about building family connections, creating security, providing limited exposure to strangers and guiding children's behavior among many other things we do all day. You will be great! 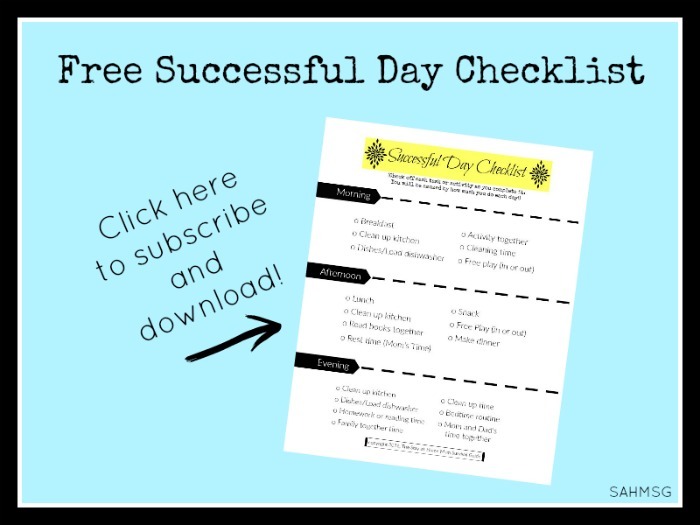 I hope you are able to give it a try-it will be an adjustment at first, but give yourself a few months to work through the new schedule and get your comfort level up. I wish you well. Stop back and let me know how it goes if you do decide to try it. Congratulations on the baby! I had c-sections as well; it will get better as you are finding. Just enjoy your days and take one day at a time. I hope the walks will be great! I loved walking on the great trails on our last base. All the best as you sort it all out. 🙂 We went through all the finances last month before baby came and I would be working half of a month for day care expenses alone. It isn't a neccessity income wise, the military pays him well and I get disability from previous active duty service. More about, like you said, the identity portion of it all….. Sigh… 🙂 Our little man came on the 5th of April, and it has been wonderful being home with him. I've gotten a bit of cabin fever (mainly because of the c-section and not being abke to hardly move about the house at first). But now I'm mobile again and enjoying being home for the baby and picking up our oldest from school. Plus the trails on base will be seeing me and baby soon for some morning/afternoon walks. Still undecided, but honestly I come to tears when thinking of leaving him with someone else now…. We'll see. <3 Thank you for this post! I can understand your apprehension about putting your career on hold for a time. (Remember, it can be temporary-kids are not home forever.) It can be hard to let go of the identity we form through 'what we do.' I still consider myself a teacher even though I stay home now, and it was hard to have people ignore my expertise because I JUST (their word) stay home. It took a couple of years to get over what others thought of me due to my choice to stop working. Make a 'pros' and 'cons' list and get your home finances on Excel or a paper format to really see how much NEEDS to come in to cover what NEEDS to go out. If you'd like a template I can email it. Staying home will allow you to see everything and be the stability for your family. If you choose to work after all, like you mention, you always have that choice to serve your notice if the daily schedule does not suit you and your family. I truly wish you the best no matter which 'job' you choose!